House Pinnaquin offers nine extremely comfortable en-suite bedrooms, seven double and two twin. All the double rooms have enclosed balconies and five of them have fine sea views. Each bedroom is individually decorated and named and is appointed with superb attention to detail, only the best quality being good enough for our guests. Our bedrooms are provided, of course, with tea and coffee making facilities, TVs with Hotel Plan DSTV, fridges and digital safes for our guests' convenience. All our bathrooms offer both bath and shower and are designed with character to make your stay memorable. 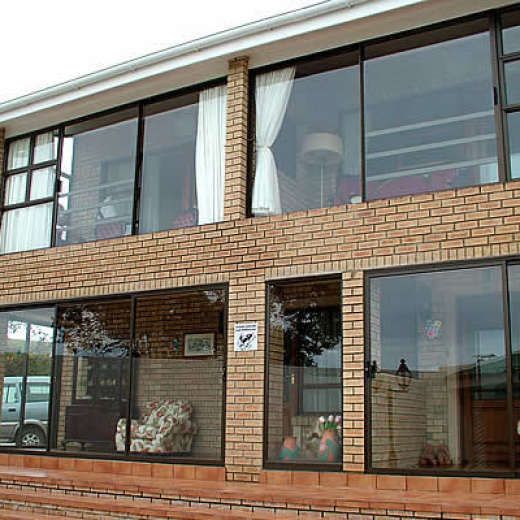 Located in the popular coastal resort of Jeffreys Bay, a short walk from the famous beaches, House Pinnaquin Guest House offers Four Star Bed and Breakfast Accommodation for up to eighteen people. House Pinnaquin is perfect for small tour groups as well as families, couples and individuals. Our large and beautiful lounge with a comfortable and relaxing lounge suite as well as the cosy little pub begs to be enjoyed. The breakfast room is generously equipped including an indoor braai and looks out onto a paved patio with a porticoed "Smokers" Den" You will find our breakfast delicious and we vary it from day to day so that you can enjoy it afresh each time.